To understand the Rose Foundation for Communities and the Environment – our values and our vision, and how that plays out in real terms – you need to understand the two programs that live at the core of our organizational heart and soul. 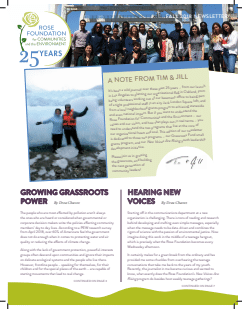 This edition of our newsletter is dedicated to those two programs – our Grassroots Fund small grants program, and New Voices Are Rising youth leadership development initiative. Please join us in growing the grassroots, and building the next generation of community leaders!